With huge industrial knowledge, Our organization is counted as a prominent Manufacturer & Supplier of designing an elegant range of AD Jewellery that is beautifully studded with diamonds. The offered Jewellery are designed by our dedicated designers by the use of finest quality basic material and the superior technology. Tip Top Jewellers Pvt. Ltd. This AD Mangalsutra set is inclusive of a pair of danglers and is studded with sparkling stones. - For shine and protection, alloy materials, american diamond, gold and rhodium plated with 18" black moti mala. It is made by hand ganthan with use of crystal moti. Ensure that you look your elegant best with this mangalsutra set from Luxor. 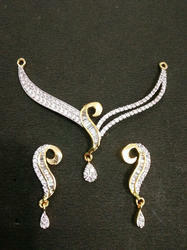 This set consists of a mangalsutra and a pair of matching earrings. It is crafted with brass and is adorned with dazzling American diamonds for brilliance and charm. It is designed delicately to bring out the smile on your face. We have variety of acceseries for you to look more beautiful. We deal in Imitation Jewelry, Artificial Jewellery, Fashion Jewelry, American Diamond Jewelry, Zircon Jewelry, Imitation Gold Jewelry, Kundan Jewelry, Pearl Jewelry, Polki Jewelry, Victorian Jewelry, Beaded Jewelry, Meenakari Jewelry, Gemstone Jewelry in Earrings, Bangles, Bracelets, Kadas, Necklace Sets, Pendant Sets, Bridal Sets, Chains, Mangalsutra and Rings. We have high quality American Diamond Mangal Sutra. These designs are for your reference, you will not get same designs. We will supply you assorted designs within your price range. - Made on copper metal. - Available in different designs and colors. We are offering AD Mangalsutra. This MS is also known as 24ct Gold Filled Gram MS. Process Way:It is handcrafted with copper alloy, when this handcrafted MS is Dipped in Gold forming machine. Gold is layered according to its dimension. This process makes the MS Look exactly same as Real.